Pinch and a Punch! Welcome to October! As I have mentioned before, I usually stamp images more than once just in case I mess up, or want to explore different colour choices, for example. Since I had another stamped image of the Purrr-fect Friends! (from Penny Black) just sitting there on the table, I decided to finish it off and make another quick card. Turns out it wasn’t as quick as I had hoped but it was still fun. 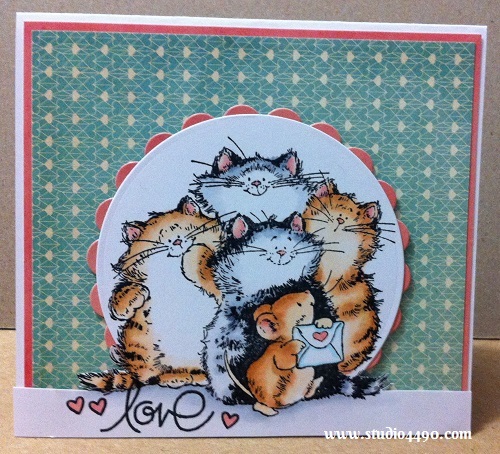 Materials used: Stamps – Purrr-fect Friends! 1746K (Penny Black), Simply Said (Paper Smooches), Critters Ever After (Lawn Fawn); Cardstock – American Crafts, Knight; Patterned Paper – 6×6 Paper Pad – True Love (Basic Grey); Copic Markers; Dies – Spellbinders Nestabilities – Standard Circles Small, Classic Scalloped Circles Large. I partially die-cut the circle around the kitty cats/mouse (and decided it looked like it should be a snowglobe so there’s an idea for another day) to do something a little different. I’ve popped up the middle panel just a little to give it some extra dimension. It’s just a sweet little card. Thanks for stopping by! Hope you all have a wonderful day! Yes, yes, yes…*more* of this stamp is wonderful; I don’t think I’ll ever tire of seeing this kitty+mouse crew! Again, the cute-and awwww- factor is off the scale. The kitty on the right with the puzzled look, really does steal the show this time (as does the mouse…as do the smiling kittens – oh, what the heck, the whole scene simply rocks!! It is soooo cute, isn’t it, Carol? I just love it. Can’t believe I hadn’t used it until this week and I have owned it for …let’s just say a while. lol Oh yeah, you are so right and it really could look great as a Christmas card. And I love your sentiment idea! 🙂 Thanks for the inspiration! Hope you have a happy day! hugs!